I like arnica oil or lotion for bruises. If I have some echinacea tincture around, I like this for stings & bites too. Aloe is nice for burns after applying cold water & ice, especially if you have a plant and you can use the fresh directly. A comfrey or calendula salve is nice to have around, good to use on pets too for skin irritations from flea dermatitis or hot spots. I like to have a face astringent on me all summer long. I tend to have oily skin, if I use the astringent throughout the day so my pores stay clean & tight and I am less likely to get skin irritation from wiping my face, getting dirt in the pores, irritating them causing blemishes. put in a wide mouthed jar with a lid, keep in a cool, dark place, shake daily for 2 weeks, strain through muslin, it will keep about 6 weeks refrigerated. The one thing I have to say is my first instinct when my skin is irritated is to take a bath, or preferably jump in the ocean (obviously not always accessible) . The ocean is very healing to me, I always add sea salt to my bath, I like a little kelp too if available. I like to wrap herbs up in a cheesecloth and hang them from the spout as the water is running, when the water is done I like to rub the bundle on my skin. I like lavender, elder flower, yarrow, calendula, & rosemary. Below are some other bath ideas. I also like to use fresh veges on my face occasionally as sort of a mask after I use a good face scrub , such as avacado, cucumber, or grape. For skin that has dead skin cells. Not for skin that is recently sunburned. A cool chamomile tea bag, or cucumbers on hot dry eyes (closed) after walking in the wind or boating is also great, I found a chamomile tea bag is also good to draw out an eye stye. 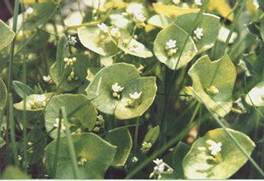 Miner's lettuce is a great wild food to try. It has a fresh, mild, sweet taste. Miner's lettuce is great on sandwiches and in salads. As you can see from the above picture it has a unique shaped leaf with the flower growing from the center, some botanists believe these used to be two leaves but eventually they merged together to make the one leaf you see above. Depending on the mood I am in, it reminds of a little round table with the flower being the center piece, sort of like the barista's at Starbucks, or a waiter holding a tray with a nice cocktail in the middle. The younger plants tend to bear single un-merged spatula shaped leaves, each arising from it's own stem. The mature plant tends to be about 6 to 8 inches high, sometimes higher in tall grass. It self-sows so easily and can probably be kept year round in most gardens. Around here in the Pacific Northwest it usually starts flowering in early May. It prefers cooler wetter climates but can also be found in other rich soil across America, sometimes I have seen it grow in a more sandy type soil as well. It grows from sea level up to about 6000 ft. This plant likes wilderness and is perfectly at home in a garden, in fact it loves manure and can be found at most ranches (because of all the horse poop) Miner's lettuce makes a beautiful ground cover and would be a delicious addition to your garden, with the mild climate in the Pacific Northwest you can grow it year round. 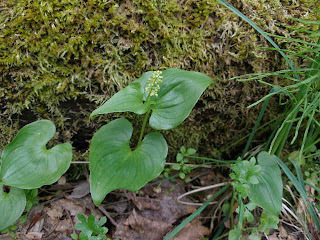 The minors mining in the mountains would eat Monitia Perfoliata with their meals for a fresh vegetable, the plant is a source of vitamin C.
Miner's lettuce is best eaten immediately after harvest. It is also great to add to stir fry. Here is a salad recipe idea to try straight out of your garden, of course experiment for your self with other tasty herbs and salad greens. 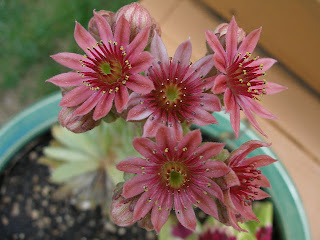 Hen & Chicks (Sempervivum sp) are among the easiest plants to grow, needing very little care, & usually difficult to fail. Yet now & then a new one will commit seppuku. I bought a handful of unlabeled Semperviva & planted them here & there in pots and garden boxes. The habit most stores & nurseries have of selling mixed hybrids with no indication of what species or variety they are is a little annoying, but O well. The one shown on this page loved its location & decided to bloom. Unfortunately, putting on such a fine display before having any chicks or developing a good root system will completely exhaust the plant & it will probably die soon after blooming. Most of the time when a given rosette of leaves puts up one of these spectacular blooms, that particular hen dies when the task's completed, or gets so elongated & scruffy it has to be trimmed out of the mass. When there are lots of chicks coming along, & other hens, one faded rosette is hardly noticeable. But if it's just one hen, alas. It's useless to cut off the stalk before it flowers because by the time the thick stalk erupts, the hen has already very likely passed the point of no return. So I will watch this beautiful display, and if the hen and chick passes, will have to say good-by. When these plants do well, (as is more common than the fate of this particular example) it clumps into a ground cover with lots of chicks around the hen. The Latin botanical name has an historical reference. Charlemagne (742-814 A.D.) recommended that his subjects plant these hardy prolific plants on the roof of their houses to ward off lightening and fire. The leaves contain tannins and mucilage that are soothing to skin. It is used in the treatment of burns, skin wounds and infections. The roman-greek scholar Dioscorides (Dioskurides) (~40-~90AD) mentioned the sempervivum in his work 'De materia medica' and recommended crushed leaves with wine to get rid of intestinal parasites. Cut leaves were used against warts, calluses, corns and insect stings - the juice was used to treat shingles and earache. As above the mashed leaves where used to treat burns and scalds. 'Naturalis Historiae' by Pliny the Elder is by far the best reference for uses of the Sempervivum. In countless passages he mentions the Sempervivum against articular gout, diarrhea, worms, stomach pain and more. The usage was either internal (juice), rubbing on the area of pain or simply applying parts of the plant on the body. Pliny uses several names for one species, but comparisons with other ancient authors lead to a certainty for attributing to modern species names. Wood Sorrel Oxalis oregana One of my favorites! When I was a kid, wood sorrel grew abundantly in the forest behind my house. I did not know it's name, and I can't remember what brought me to try eating it. I just remember I ate it every time I went exploring through the woods. When friends were with me I would talk them into eating it too. Their reaction (after some hesitation to try it) was always "WOW". Wood sorrel has a wonderfully sour taste. Great to add to salads, or to just eat as you are walking the trails. I have also heard the root stalks where used (back in the "old days") to make a pie similar to rhubarb. We harvested rhubarb every year in the field behind my house and made tuns of pies & crisps, I wish I would have thought to add the sorrel, perhaps this year. Medicinally this herb is a diuretic. My personal experience is this plant helps with minor stomach complaints, nausea. The herb is rich in vitamin C. I have heard some warning of the oxalate content of this plant, for more info on this read my post in the wild foods section on oxalate content in plants. Oregon Wood sorrel is the species of sorrel I discussed above (oxalis oregana). This plant looks like a shamrock and is a gorgeous ground cover. There are other types of sorrel's (also called sheep sorrel) such as Rumex acetosella mountain sorrel, Oxalis stricta Cascade sorrel, as well as some poisonous look-a-likes you should be aware of. The other species I mentioned have arrow head shaped leaves, this can be mixed up with Solanum Dulcamara or bittersweet nightshade & the bindweeds Convolvulus arvensis that also grow in similar habitats. The other sorrels have succulent leaves with some body to them, they are not papery or leathery. The sorrels are found in 4 basic forms. A plant whose leaves all rise from the ground ( a basal cluster of leaves sometimes forms a rosette); a plant with an upright flower stalk, with a rosette of leaves at the base; a colony of plants so intermixed you see a whole bed of leaves arising form the ground; or an intermixed colony of flower stemmed plants resembling tall reddish grass. Sheep Sorrel often grows in colonies of exact clones, it reproduces by quick spreading rhizomes. Colonies are great because they make for easy harvesting. The best way to distinguish sheep sorrel (rumex acetosella, ocalis stricta) from the other poisonous plants is sheep sorrel's leaf is wider at the tip and the lobes are not typically aligned directly across from each other. You cannot see the veins in sheep sorrels leaf unless you light it from the back. The flowers are small and red. Most bittersweet nightshade plants have leaf lobes that are separate from the rest of the leaf blade. The veins in the leaves clearly arise out from a main vein. Nightshade's stems get woody and can grow to be yards long. It has rocket ship shaped flowers that have purple petals and yellow anthers. Field Bindweed's leaf lobes are directly across from each other, like bittersweet nightshade the veins arise directly out from a main vein. The vine stems twine around the stems of other plants. It's flowers are trumpet like, white or pink, and large. Sheep sorrel grows all over North America in a varity of habitats. Mostly it likes acid, disturbed soil. I have found the wood sorrel in most shady wood areas around the Pacific Northwest. Camping is very rejuvenating to me, not only is being out in nature healing, but the change of being outside and being aware earth’s sun and moon cycle is very uplifting. Being connected to this natural earth rhythm is a welcome change. If you can’t make it camping, you may want to try to rise and sleep with the sun or live without electricity for a weekend and then monitor how you feel. Eating the foods that are in season and locally grown also help you to get in tune with the earth. I believe it is good for our bodies to eat the in season foods, live with the seasons. When spring comes around I naturally get a sense that I want to start something new, I feel renewed, more alive. I like to create harmony in my home by making a smooth transition between my indoor and outdoor spaces. 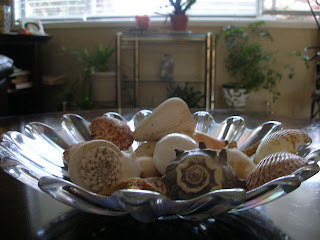 I also love the ocean so I have several shells I have found beach combing, along with my rock collection adding to my décor both inside and out. 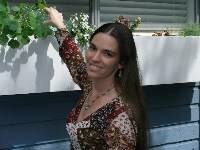 I have several indoor & outdoor plants. I like to put comfortable furniture outside, so in the morning I can sit and enjoy the fresh breeze. By making the outdoors more comfortable, I can easily sit and watch the wildlife, smell the fresh air, and enjoy the moon & stars at night. The more often I do this, especially when I lived at the coast, I found myself noticing the pull of the full moon on bodies of water, as well as feeling this in my body. As I try to seek more balance in my life, I want to balance not just my role in life, but also the natural elements in my living space. Having natural elements in my home is good for my mind, body, and spirit, as well as it gives my home a good overall energy. Often when I have friends over they pick up my rocks or shells, it is like they can’t help but touch them. Inevitably, we always have a conversation about where they were found or about nature. I find most people really do not get enough nature in their lives. 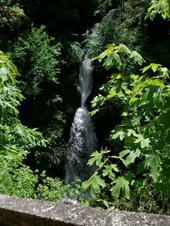 I find when I am more in tune with nature both in my home and outdoors my energy is more in sync and I feel an overall sense of balance and well being. One of the best remedies Gardening! Gunnera, Giant seeds OK, Not medicinal but medicinal to the soul, huge whimsical looking plant. * The delightful book "Kidzerbs" written by Sena Cech, featuring Cheesie Herbalmouse. * 13 packets of organically grown seeds (Basil, Borage, Calendula, California Poppy, Catnip, Chamomile, Sage, Fennel, Feverfew, Flax, Johnny-Jump-Up, Lemon Balm and Love-in-the-Mist.) This part of the garden is going to be for Ella, she is going to get her own little sign and everything! I am also going to put a fairy castle and gnomes. She will have her own mini tools and watering jug. If you haven't noticed I am also a kid at heart, I will have fun with this plot! Gift Blend Packet Calendula, Echinacea purpurea, Elecampane, Feverfew, Motherwort, Wood Betony and Yarrow. Just the anticipation for my seeds to arrive has gave me a new passion! Can't wait to tend to my plants and get started. Growing season is late up here, it is cool this week so I should be safe. I really believe growing, Harvesting and tending to your plants is one of the best overall remedies. There is really nothing like it. Great exercise, great stress relief, great for the soul, and the plants love it too! One bummer, they were all out of Osha plants and I really wanted some! I will have to wait for fall and order the seeds. As a child as far back as I can remember, as single tiger lily grew in the woods behind my house. I would wait with anticipation for the day that the tiger would emerge, a spot of orange against all green foliage. I dare not pick it, I knew even at 6 years old this flower was very special. I would hike up the steep embankment just so I could get close, I would just sit, starring at it's magnificent beauty. The lily made me feel like I was at a far away place, an exotic place, not simply behind my house. I felt like I was in a dream. I left the place feeling like I just found a treasure that no one else knew about, a spring in my step, a rush, a mischievous smile ( I know something you don't) Yes magic, that is what it is. Every year I would go back to say hi to my friend. Sadly, the woods are gone but the Tiger Lily will always live in my heart and memory. Tiger lily symbolizes passion "my love knows no bounds"
Need to know if you have any information about Jaramla, (Phyllanthus amarus) I am trying to get it growing, but am having a hard time getting it germinate. What I have read it is suppose to be able to use as a pain reliver instead of aspirin. This got me thinking about Cox 2 inhibition herbs. Thought I would write about their benefits. Of course I don't believe in "magic bullets" but these herbs along with a wellness lifestyle, nutrition and exercise can be a great asset! Green Tea: Has Salicylic acid created from salicin (first found in White Willow) German scientists added acetic acid to salicylic acid and discoverd it chemically buffered the highly irrating effects of the isolated compound- the Aspriin Century began. Ayurveda employed green tea for many medical conditions including fever. The constituents polyphenols (GTP) and antioxidents may be useful in prevention of arthritis. The Napralert Database reports that green tea has 51 anti-inflammatory compounds. Long term consumption of Green tea has been shown to inhibit ulcers that might be triggered by NSAID use. The phytochemical Database reports that green tea has 15 anti ulcer phytonutrients second only to Ginger (17). Barberry: Contains Berberine which has been used for its ant-inflammatory effects. Catawba Indians in North america used barberry to treat peptic ulcers. In bulgaria and Eastern Europe, root extracts of the Berberidacea species where used in chronic inflammatory disorders. A study in Japan of found Chinese Goldenthread and it's constituent berberine where found to supress colon carcinogenesis and to inhibit Cox 2 without inhibiting Cox 1. In other words berberine according to studies has been selected as a Cox 2 inhibitor. Berberine has many benefits across a spectrum of diseases, I still believe in the wisdom of the whole herb approach. Research at Bulgarian Academy of sciences tested the anti-inflammatory capabilities of a full spectrum extract of barberry vrs 5 of it's other active fractions. The total herb extract demonstrated the greatest anti-inflammatory effect. The study also showed that the full spectrum total herb extract was most effective in reducing the inflammation associated with arthritis. The fractions were not as effective. Holy Basil: The Hindi name tulsi means "matchless" which shows it's importance and status in Ayurvedic medicine. This herb is said to be sacred to the goddess Lakshmi and her divine husband Vishnu the Hindu deities responsible for maintaining balance in life and creation. Ocimun sanctum holy basil (not the same as culonary basil Ocimum basilicum) contains a phytonutrient ursolic acid specifically recognized for it's Cox 2 inhibitory effects. Studies are being conducted on this constuent ursolic acid and oleanolic acid examining it's Cox 2 and cancer preventing effects. Just like green tea, this herb has anti ulcerative effects. There has also been scientific confirmation that holy basil is antimutagenic, radioprotective (protect DNA of body from mutating power of radiation) this could be from sun, radiation therapies et it does not protect us from the exposure rather offers a way to strengthen our defense mechanisms to better withstand it since radiation has a cumulative effect on the body, and has anti tumor effects in human skin, it has also been shown to increase the enzyme called glutathione S trasferase (detoxifying enzyme) activity. Turmeric: A whole book could be written about this herbs benefits! I have had great success with my massage clients and this herb. Very beneficial with inflammatory conditions such as arthritis. There has been studies that show curcumin and major phytochemical in the root directly inhibited the activity of Cox 2. It has been shown that phytonutrients in turmeric inhibit the mechanism that creates the blood supply needed for tumor growth. Some studies show that turmeric is a colon cancer and skin cancer suppressor. Both topically and orally turmeric is a strong anti-inflammatory The precise way curcumin and turmeric inhibit cox 2 is the subject of continued study. All I know is my clients say it works great for their inflammatory conditions. I prefer the use of the whole herb turmeric, not isolated cucumin (when isolated it is now a pharmaceutical chemical) extract (too much can easily be taken, causing problems having the exact opposite effect of the full spectrum herb turmeric) The combined constituents of the whole herb of turmeric are a natural ant-oxidant have and work synergistically together. Rosemary: Rosemary is great for just about everything! I have a special relationship with this plant. She talked to me the day my Grandmother passed, I took some with me to the hospital knowing my Grandma was already gone (even though I was not officially told) The herb symbolizes remembrance and to this day I think of Grandma every morning when I go outside and sit by rosemary. I used to gratefully pick a bit off on my way to school before every test for luck, rosemary has traveled with me to every house I have ever lived ( 4 in the last 6 years). Apply rosemary topically for aching muscles. Ursolic acid is also in rosemary possessing a Cox 2 inhibitory effect. Studies have shown that rosemary inhibits the processes that are known to fuel tumor growth. You may want to read my post on rosemary wine as well. I could and will spend a lifetime with this herb and still will never fully understand her, such a deep love and appreciation I have for this plant. Ginger: In Ayurvedic medicine this herb is known as vishwabhesaj, or the universal medicine. Ginger is another one of my favorites, I used it frequently as a child, I suffered from many stress induced stomach problems. Ginger was my ally again during my pregnancy with Ella. Ginger has about 477 constituents and actions and 500 compounds, Let's just say it is also a Cox 2 inhibitor, it is the opposite of Celebrex (celebrex having only one molecule, designed to do one thing) Ginger also has anti-ulcer effects. Ginger has powerful cox 2 inhibitors and demonstrates 56% inhibition of inflammatory prostaglandins (creation of prostaglandins appears to be mainly a function of cox 2 activity). Ginger along with feverfew contain melatonin, a hormone secreted by the pineal gland and metabolically related to serotonin. So our brain and ginger express the same hormone! Melatonin is structurally related to and internationally recognised NSAID known as indomethacin, and Japanese research confirmed that ginger has at least 4 prostaglandin inhibitors more powerful than indomethacin. Last year I ordered some Purple Moi Kava Kava from Nuka Hiva Trading Co. Great place! http://www.nukahivatrading.com/kava.htm I also ordered a variety called Isa. As a massage therapist I run into a lot of people with chronic lingering back, neck and shoulder pain. Last year I made up a large batch of tincture of the Purple Moi & Isa variety (I noticed Purple Moi is no longer on their web site :(. 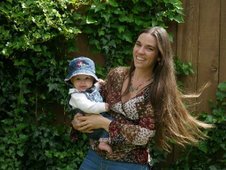 I really didn't get a chance to use much of it myself because shortly after I became pregnant and I am now nursing. So I started giving some away for people to try. The overall interesting responses I received were great. All of the people who tried Purple Moi had similar responses. Chronic pain is often accompanied by mild depression, you really just don't feel like doing and enjoying anything. The people who tried it said they immediately felt like doing the things they needed to do to take care of their pain such as exercising! While the Purple Moi Kava Kava did not take the pain completely away, it did give them the emotional boost they needed to accomplish their goals, most reported it definitely took the "edge off" the pain as well. The dose was a few drops up to 20 drops depending on the person. Some were couch potatoes or people who went to work only, then went straight home to watch TV. The important thing to note is that these people had tried Kava and said "there was just something about this one" that gave them a little extra boost. Overall all mood was drastically improved, many felt like setting future goals and had more hope for recovery. Of course this is not a study, several factors could contribute to these responses, the interesting thing is most reported this mood shift immediately after taking the Kava, within minutes. This lovely plant is native to the Pacific Northwest. It sways in the wind and as it moves it truly reminds you of the ocean spray. A member of the Rose Family I feel a deep connection to this plant. The blooms are really beautiful this time of year. Although you would not normally associate this tall shrub with other roses, Darcey's blog and Kiva's blog posts about wild roses got me to thinking about this plant again. You may not recognize this plant when it's not in bloom. I Makes a nice garden border plant because it gets very tall. The coast is my home away from home, I had the opportunity to live there a few years back until lack of jobs and money forced us to move. Now it is only a 2 hour drive from my house so I enjoy frequent day and weekend trips. The benefits of the flower essence of this plant are interesting. Covering over deep grief and taking care of daily life as if everything is fine. This may be such an ingrained way of being that you don't even realize you are doing it. Deep skin issues, like eczema, or respiratory problems can be an indicator that this essence would be helpful. Ocean spray Flower Essence allows old grief and sorrow to surface and be released. Supports living in your own jubilant Presence. Native Americans Found this herb useful in many ways. 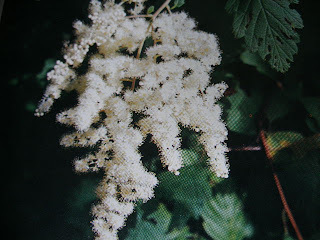 Medicinally the Lumi tribe of Washington used Ocean spray blossoms used for diarrhea, Infusion of inner bark used as an eyewash, poultice of leaves applied to sore lips, poultice of leaves applied to sore feet. Makah used a decoction of bark taken as a tonic by convalescents and athletes. infusion of seeds taken for smallpox, black measles and chicken pox. Decoction of leaves taken for influenza. bark dried, powdered, mixed with Vaseline and used on burns as a dressing. powder of dried leaves used for sores. seeds as a blood purifier. Many other tribes made uses of the hard fire resistant wood. The branches were used as tongs, to make arrows, fishing hooks, drum hoops, digging sticks, toys for children, teepee post holders, bows for children and more. False Solomon's seal is a perennial. It grows from rhizomes, it will take over your yard if you let it. Native Americans ate the young greens, fleshy rhizomes, and the ripe berries of this plant. The rhizomes were cooked after being soaked to get rid of their disagreeable taste. The rhizomes were also utilized as a poultice, and brewed to make a tea to treat rheumatism, sore back, and kidney ailments. The berries were eaten raw, though they do not taste very good. I have also read that the smoke from the leaves was inhaled for head aches. I don't think it has modern uses, I have read conflicting info on these plants and some say they are toxic. I have not spent a lot of time studying these plants, I think they are simply beautiful and a wonderful addition to the woods out here in the Pacific Northwest. False Solomon's seal is so named because its leaf stalk resembles that of Solomon's seal (Polygonatum multiflorum). 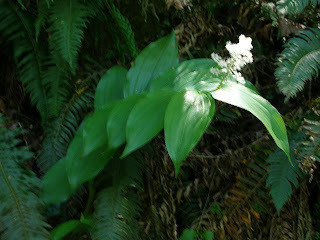 However, Solomon's seal has bell-shaped flowers hanging individually along the leaf stalk. Solomon's seal is thought to have gotten its name either from markings on the rhizomes resembling a 6-pointed star, or from the hanging flowers resembling a seal on a document. Feathery False Solomon's seal. Flower's are on top. The berries are edible, but bitter. It is called false as it has none of the medicinal properties of the eastern Solomon's seal. 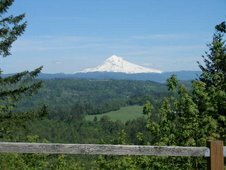 It did have uses to the Native Americans in this region (Pacific Northwest) but as far as I know it is not used in modern herbalism. I plan on doing more research on these plants just to get to know them, they sure are beautiful! On my way to the Sandy River her in Oregon there are cliffs that border the road. The Feathery False Solomon's seal hangs from them with it's beautiful flowers, often surrounded by moss and ferns. The smaller False Lily of the Vally is common along the rivers edge. To a certain degree, we rely on other people's accounts, books, tradition ext to inform us about plants. For example, we can't all be botanists, but we can benefit from taking their findings to heart. In the same way, we often look to teachers, various leaders, and gurus to tell us about the right thing to do when it comes to our bodies and using plants. While this input from experts is undeniably valuable, our own sense of the truth by what the plants tell us, our intuition and prayers, and what our own bodies tell us is ultimately the most important piece in processing the information we take in from external sources. In the end we will decide what resonates with us and what a particular plant is telling us. We need only take a brief look at history to remember that even the most respected teachers and leaders were all wrong about something at some point in time. This is the beauty of learning, experiencing, and evolving. While we sometimes wish we could just let someone else decide for us what is good for us & true, this is clearly not a wise option. Great news! We can confidently devote ourselves to making up our own minds about what a plant is teaching us, taking everything that we are told by others as truth with a grain of salt. This does not mean that we discount the information we receive from teachers or outside sources. It simply means that we can stop to question it before we decide whether or not we agree with it. All the information we receive is useful in the process of helping us make up our own decisions. 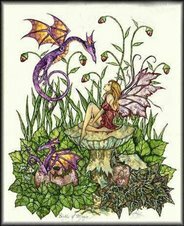 As we allow ourselves to process the things we learn, measuring them alongside our own inner sense of the truth, and our own experiences, we find that making our own decisions about healing & plants is joyful, and a excellent learning experience that makes us grow. Listen to your body, listen to the plants. Follow your instincts yet be safe. If fasting, doing a colon cleanse or any other method that is stated “necessary” by others does not resonate with your body, don’t do it, don’t try to make others do it. Sharing your knowledge is wonderful, pushing it down others throats and stating it as "fact" is a whole different story. The more I know the more I realize I don’t know, and that we are all different with amazing bodies and energy that need different healing methods.That is why I love herbalism, the plants & people have constant lessons and miracles to teach me. Dream pillows have been around for many many years, it was common place for our grandmothers to stitch up a headache pillow to erase the pain of headaches or have a dream pillow on every bed filled with natures bountiful herbs and flowers. Maybe I am posting this because of my lack of sleep LOL. Moving, new baby, really could use some sweet dreams! d.. Essential Oils : choose any of the following - Yarrow, Sandlewood, Jasmine, Geranium, Basil, Lavender, Peppermint or Rose. 5-7 drops. 4. Fill mesh bag with a mixture of the flowers and herbs as well as a few drops of essential oil. Insert into a mesh bag, tie off with a string. 5. Place inside your pillow form and fill with pillow stuffing...don't over-pack as it needs air circulation to release some of the scents. 6. Finish pillow off by adding velcro to the open end of the pillow, this will allow you access to change the herbs and flowers when needed or to wash the pillow itself. Its best to keep the pillow in a flat shape not round. It will be inserted into a regular pillowcase for a sensational nights sleep. Sage for peace, wisdom and healing. Place it on or by your pillow. Maidenhair for grace, beauty and love. To be use on the 3 days of the full moon. Note that the above recipes make 5-6 dream pillows a piece. to be placed on the forehead. in the freezer. Just mush it around to get the natural scents to come out. Reference: some of these recipes were sent to me a while back by off another list, the sender wrote author unknown but appreciated! Well I am back in internet land! I wanted to bring up this topic because now is the time many people collect wild foods. Let me first point out this article is about soluble oxalates, not calcium oxalate crystals, found in skunk cabbage, jack in the pulpit - these are a real problem and I will discuss these in a future post. Once you start collecting wild foods you will inevitably run across this topic. You will hear statements ranging from "don't eat to much of those" to "You could die! Fear Fear!!!". In this post I will explain what oxalates are so you can make an informed decision when collecting wild foods. Oxalates or oxalic acids are naturally occuring and found in almost every thing that is living. They are water soluble as sodium oxalate or potassium oxalate salts. 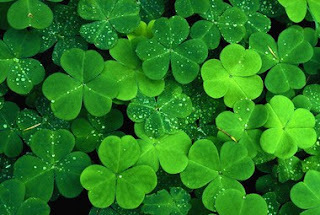 They are found in greater quanity in some plant families such as wood sorrel (oxalidaceae) buckweat (polygonaceae) and goosefoot family (chenopodiaceae). Some of the specific plant that have higher concentrations are sorrels, rhubarb, spinach, wild spinach, docks, Japanese knotweed, black tea, & cocoa to name a few. High concentrations of oxalates are often accompanied by higher concentration of calcium. Oxalates are a normal part of the diet and amino acid and asorbic acid metabolism. The old literature such as the classic book Poisonous Plants of the United States and Canada by John Kingsbury warns against soluble oxalates. People tend to site this literature word spreads, an it becomes fact, oxalates are bad news. What should be considered is the book is a primarily a review of animal research, with these facts applied to humans. Even the author states in his book "Oxalate poisoning (even in animals) is fundamentally complex and poorly understood" This is my opinion, I am not a fan of animal studies. We (humans) are not cattle or sheep, in physiology or diet habits. Do you eat pounds of grass each and every day? Would you want to even if you had the time? Most of us have a very diverse diet. You can see where the focus on cattle and sheep for data on calcium deficiency in metabolism, comparing this to humans & there complex physiology and metabolism, there is a problem. As far as I know, there have been no verified cases of toxic intakes of the naturally occurring soluble oxalates in humans. Most dietary oxalates are excreted in the feces. It is true that Oxalates can bind with calcium in the digestive tract making both the calcium and the oxalates unavailable for absorption. However, calcium and oxalate blocking or absorbtion is a complex metabolic process, to specifically say oxalates block all calcium absorbtion would be incorrect. The body is extreamly adaptive over time, and will find a way to absorb calcium to spite stomach contents. We convert excess vitamin C into oxalates that get filtered through the kidneys and come out in the urine. High intake of vitamin C results in greater oxalate production than any healthy consumption of vegetables high in oxalates. If you have a abnormal physiological propensity for kidney stones, chronically undernourished in calcium, vitamin D and Phosphorus, or in the middle of a fast (hard on kidneys) I would watch my consumption of high oxalate foods. Other than that you can see I think soluble oxalates are not a danger. Enjoy your wild foods!